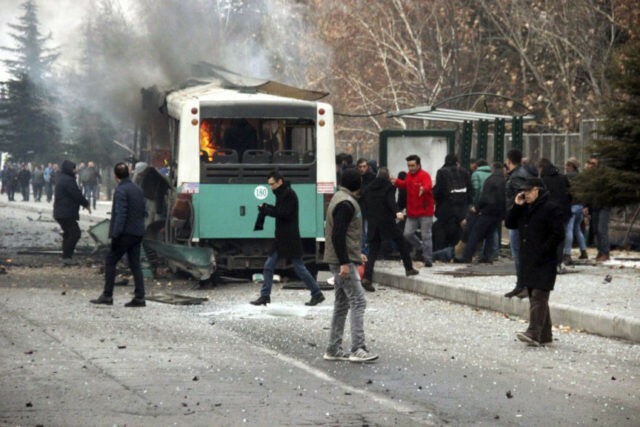 A car bomb attack on a bus carrying off-duty military personnel killed 13 soldiers and wounded 55 in the central Turkish city of Kayseri on Saturday, an incident President Tayyip Erdogan blamed on Kurdish militants. The blast, a week after deadly twin bombing targeted police in Istanbul, is likely to further outrage a public angered by a series of attacks this year – several claimed by Kurdish militants, others by Islamic State – and a failed coup in July. It is also likely to increase tension in Turkey’s mainly Kurdish southeast, where militants from the Kurdistan Workers Party (PKK) have waged a three-decade violent insurgency that has seen some of its worst fighting in the last year.